Update: 4/13/2010: See new post for 2010 season, Avoid the late blight blues. Update: 1/7/2010: Late Blight Q&A from the Northeast IPM Center. Update: 8/11/2009: New factsheet from NYSIPM program: Late Blight: A Serious Disease of Potatoes and Tomatoes. Update: 8/10/2009: Fungicide info for home gardeners added to Meg McGrath’s late blight photo gallery. Update: 7/29/2009: Cornell Plant Disease Diagnostic Clinic late blight factsheet has been updated to list chlorothalonil products registered for home garden use in New York State. Update: 7/20/2009: View new Late Blight FAQ and Late Blight: Corrections of Misinformation by Meg McGrath. Update: 7/10/2009: Photos of late blight on potatoes added to Meg McGrath’s plant disease photo gallery. Update: 7/2/2009: See also: Cornell Chronicle article. Update: 6/29/2009: Late blight webinar, Thursday July 2, 7:30 to 9:30 p.m. See details at end of post. Via Meg McGrath, Department of Plant Pathology and Plant-Microbe Biology, Cornell University. Home gardeners need to be on the lookout for Late Blight – a very destructive and very infectious disease that’s killing tomato and potato plants in gardens and on commercial farms in the eastern U.S.
Classic symptoms are large (at least nickel-sized) olive-green to brown spots on leaves with slightly fuzzy white fungal growth on the underside when conditions have been humid (early morning or after rain). Sometimes the border of the spot is yellow or has a water-soaked appearance. Spots begin tiny, irregularly shaped and brown. Firm, brown spots develop on tomato fruit. You need to act quickly to protect your garden-grown tomato and potato plants and to make sure that your plants don’t become a source of spores that could infect commercial farms, as late blight spores are easily dispersed by wind. Examine your tomato and potato plants thoroughly at least once a week for signs of late blight. 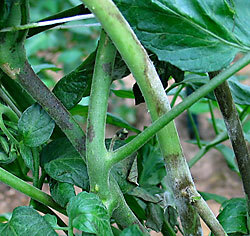 Be prepared to destroy your plants when late blight starts to become severe. Seal them in a plastic bag. Do not put them in the compost pile. Leave the bag ‘cooking’ in sunlight for several hours to kill plant and pathogen, then put in the trash. Fruit can rot quickly once infected, but any part not affected is safe to eat as this pathogen does not produce a toxin. If you want to try to control late blight with fungicides, you need to begin spraying fungicide now – even before you see symptoms – and you need to continue spraying regularly. Use a product that contains chlorothalonil. Copper is not very effective on late blight. Petunias, which are closely related to tomatoes and potatoes, can also be infected by late blight and show similar symptoms. Late blight is very destructive. Uncontrolled it will kill plants faster than any other disease. And it affects tomato fruit — especially green ones. Considering how early it is in the growing season, how long it will be until tomatoes peak and potatoes are at a size worth harvesting, and how much spraying you may need to do in an attempt to prevent loss to late blight, seriously consider growing more of the other vegetables instead of tomatoes and potatoes this year. Even with fungicide applied every week, there is no guarantee of success, especially if the rainy weather continues. This year late blight has been found on tomato plants being sold at garden centers in New York and other states in the greater northeast. If you started your own tomatoes from seed, they are unlikely to be infected, at least initially. This pathogen is not thought to be able to survive in seed. If you purchased your plants at a garden center and they show signs of late blight, please contact your local office of Cornell Cooperative Extension or Cornell’s Plant Disease Diagnostic Clinic to get confirmation and tell them where you purchased the plants. Another disease affecting gardens and farms in the Northeast is a relative newcomer — basil downy mildew. In 2008, the disease was severe on many of the region’s farms. It often went unrecognized because it was new and the major symptom – leaf yellowing – looks similar to nutrient deficiency. The downy spore-bearing structures only appear on the undersides of leaves. For more information (including how to report basil downy mildew infestations), Cornell’s Vegetable MD website. On Thursday July 2, from 7:30 to 9:30 p.m., vegetable specialists from Rutgers University and Cornell University will be holding a webinar on late blight and other important diseases of tomato will for interested homeowners, master gardeners and extension personnel in the Northeast. Click on the above link by clicking on the hyper-link (You can join the session up to _ hour before it begins). Type your name or nickname in the box. We recommend that you visit this link to make sure that your computer is configured properly to use Elluminate software. Simply click on this link (http://www.elluminate.com/support) before the session date and follow steps 1 and 2. For more information on the webinar, please contact Steven Komar, Sussex County Agricultural Agent, New Jersey Agricultural Experiment Station at skomar@aesop.rutgers.edu or at 973-948-3040. ‘It always comes down to weather. We had reasonable snow cover this winter, and we also had a fairly dry spring, so the bees were out and about flying around in pollination. Of course, we’ve had a bit of rain lately, which is not always the best thing, but as long as it’s not too much, it certainly helps the berries. 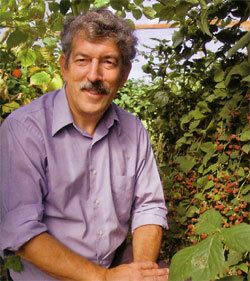 Looking for a berry farm? See this list of berry farms from the New York State Berry Growers’ Association. Update: 7/14/2009. From Marcia Eames-Sheavly: Join us at noon on Wednesday, July 22 on the patio adjacent to Kennedy Hall where Felder will give an impromptu presentation from his truck. This presentation is free and open to the public. 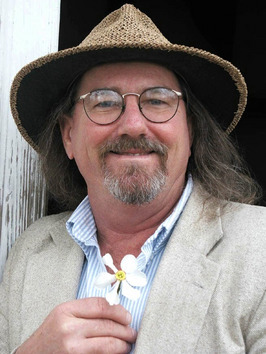 Author, radio host and garden maverick Felder Rushing is coming to the Living Sculpture Conference July 22, sponsored by Cornell’s Garden-Based Learning Program. In addition to being a conference participant, Felder will park his pick-up somewhere near the Ag Quad (details to come) around noon on the 22nd for a short, impromptu talk that’s open to the public, focusing on his “slow, easy, cheap and green” approach to gardening. On the evening of the 23rd, he’ll reprise his pick-up truck talk in downtown Ithaca. Downtown Ithaca event canceled. 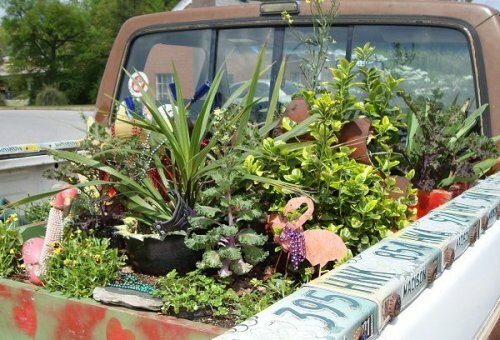 Felder Rushing’s pickup truck garden, courtesy Karen at Rurality. Laurie Drinkwater is one of a group of 17 authors of Nutrient Imbalances in Agricultural Development in the current issue of Science (324:5934). According to a Cornell Chronicle article, Midwest farmers overfertilized their corn in the ’70s, but they increased yields and synthetic nitrogen fertilizer use efficiency by the mid-’90s. Yet, the environmental consequences of using inorganic fertilizers have persisted, says Drinkwater, an agroecologist who studies the Mississippi River Basin. Nitrogen runoff from farms has drained into the basin and then into the Gulf of Mexico for years, creating huge “dead zones,” including one that grows to an area the size of New Jersey in the summer. The dead zones are due to the runoff nutrients that fuel massive algal blooms, which, in turn, consume most of the water’s oxygen, making it uninhabitable to fish. In addition, ammonia from fertilized cropland has become a major source of air pollution, while emissions of nitrous oxide form a potent greenhouse gas. Dilmun Hill is Cornell’s student-managed organic farm. To get involved or find out more information about programs and activities, visit the Dilmun Hill website or email email dilmunhill@cornell.edu. 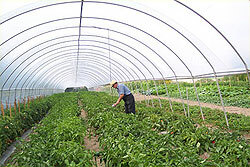 Lengthening the growing season in the June 19 Ithaca Journal extols the virtues of high tunnels. These unheated, metal-framed, plastic-covered structures allow growers in cool climates like New York to extend their harvest season for vegetables, fruit and cut flowers. 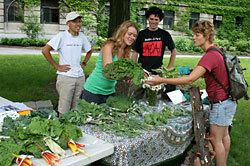 … the movements for local food and sustainable practices are driving some purchases. High tunnels represent a way to extend the short local food season in upstate New York. Their cost – about $4,000 for the most common size – can be recovered in one or two growing seasons by a small producer. For more about Cornell’s high tunnel research and extension efforts, see the Cornell High Tunnels website and blog. In Next Generation of Vintners Ready to Pick, the Rochester Democrat and Chronicle profiles Viticulture and Enology junior Ben Stamp and two CALS alumni as future leaders of the Finger Lakes wine industry. The feature includes a video profile of Cornell graduate Fred Merwarth and his wife Maressa Tosto Merwarth, Hermann J. Wiemer Vineyard, Dundee, N.Y.
Horticulture students head to Belize to show how gardens enrich schools (page down to second story) was one of the stories profiling projects demonstrating Cornell’s global impact in the Summer 2009 issue of Ezra, Cornell’s quarterly magazine. The trip last spring was led by Marcia Eames-Sheavly and Christine Hadekel, and included 9 students and three three Cornell Cooperative Extension educators who together trained teachers and created two school gardens. 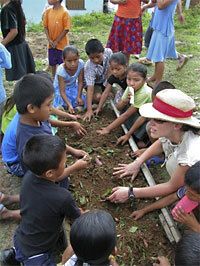 They also led numerous nutrition, market, composting and basic garden-based activities for some 140 children and their teachers in two Mayan communities to help link the gardens to school curricula and community programs. Michael Dosmann (PhD ’07), now curator of living collections at Harvard University’s Arnold Arboretum, is one of the professionals featured in a series of videos by the Center for Public Horticulture. I wear 365 different hats — one for every day of the year, I think. But it’s great. … My job is to make sure our collection [of about 15,000 plants] is a living, breathing entity. … The rewarding part is telling stories about trees. Every plant has a story or two — or 10 or 100. More video advice from Michael on careers in public horticulture. View the rest of the videos. Information about undergraduate and graduate programs at Cornell (including Public Garden Leadership) that can help prepare you for careers in public horticulture. Thinking of getting into the wine and vine business? Check out the new New York Vineyard Site Evaluation System. This new online tool uses interactive layered maps showing climate, topography, soils, and minimum winter temperatures to determine the best spots to grow vinifera grapes, standard hybrids, or native cold-hardy varieties in New York. 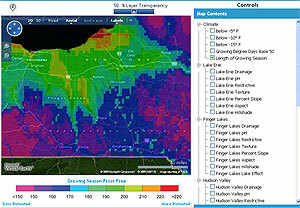 The site was funded by the NY Wine and Grape Foundation’s Total Quality Focus program and developed by Dr. Alan Lakso, Department of Horticultural Sciences, New York State Agricultural Experiment Station, Geneva, N.Y., Tim Martinson, Cornell Cooperative Extension’s Statewide Viticulture Extension Program, and the Auburn-based Institute for Application of Geospatial Technologies (IAGT). Visit the site or read more about the project in New York Unveils Aerial View of Vineyards in Wines and Vines. Update [6/11/2009]: See also Cornell Chronicle article, Online tool helps N.Y. grape growers pick vineyard sites.